This paper was presented by Jodie Blackstock, Director of Criminal and EU Justice Policy at JUSTICE, at the conference The EU Charter of Fundamental Rights: An essential tool for UK practitioners, held on the 29th March. This is the second part of the paper. The first part was posted yesterday. Any limitation on the exercise of the rights and freedoms recognised by this Charter must be provided for by law and respect the essence of those rights and freedoms. Subject to the principle of proportionality, limitations may be made only if they are necessary and genuinely meet objectives of general interest recognised by the Union or the need to protect the rights and freedoms of others. This is a test of proportionality developed by the ECJ (in particular Case C-112/00 Schmidberger Internationale Transporte und Planzuge v Austria  ECR I-5659 in which an environmental protest was held blocking a road for 30 hours and the claimant company complained that their right to free movement of goods was infringed. The Court considered arts 10 and 11 ECHR which are not absolute rights and applied the above test, concluding that it had been a limited disruption for a genuine aim and efforts had been taken to limit the impact, whereas a ban on the demonstration would have been an unjustified interference with freedom of expression). The Explanations confirm that the reference to ‘general interest’ relates to art 3 TEU as well as arts 4(1) TEU, 35(3), 36 and 346 TFEU. This general provision is in contrast to the specific limitations provided to the rights under the ECHR which can be derogable but also absolute. In Schmidberger the Court recognised that arts 2 and 3 ECHR were non-derogable so it is reasonable to assume that these rights will nevertheless be similarly interpreted. In any event, article 52(3) CFR provides that rights corresponding with those in the ECHR must be interpreted with corresponding meaning and scope though it goes on to state that this does not preclude more extensive protection within the EU ( see below). Since the ECtHR considers the margin of appreciation to be afforded to the state in cases before it, the impact of this doctrine will also apply in the EU. However, whilst the ECJ has considered the margin in previous cases, sometimes by a different analysis, (Schmidberger, but above analysis applied; Case C-274/99 Connelly v Commission  ECR I-1611 where the principle was not applied on the facts) it applies the limitation test differently, bearing in mind the democratic set up to EU law making and the scope of the Charter’s application. Nevertheless, the margin of appreciation could be an important consideration where a member state seeks to derogation from an EU law and whether the Charter should be applied or limited in that instance. Article 52(2) requires that rights recognised by the Charter for which provision is made in the Treaties shall be exercised under the conditions and within the limits defined by those Treaties. Fundamental rights were scattered through the previous treaties and this provision aims to retain consistency with the remit the European Council previously expressly agreed, in particular Union citizenship and non-discrimination. The Explanations unfortunately provide no list of which rights are decreed to correlate with a Treaty right, rather intermittently it comments where a right is based wholly or partly on a Treaty provision. As such, this raises three issues as to where article 52(2) is engaged. Firstly, there are situations where it is not clear how the relationship between the two provisions should operate in the application of the Charter. For example article 21(1) CFR prohibits all forms of discrimination whereas article 19 TFEU merely empowers Union action on discrimination. Equally article 19 TFEU provides for legislative acts including harmonization which will allow horizontal effect, but article 21(1) CFR is similar to article 14 ECHR and only prohibits Union institutions and member state action when implementing EU law (cf Kukudeveci etc). This may ultimately mean that for the wider rights provided in article 21 CFR/ where action under article 19 has not been taken, article 52(2) is inapplicable. This will be the position for all Charter provisions. Secondly, where the Treaty has been interpreted by secondary legislation, through regulations, directives, decisions, etc, do these limitations bind the application of the Charter? This would arguably defeat the whole purpose of the Charter. The normative jurisprudence of the ECJ has interpreted secondary legislation since inception and where this has not accorded with fundamental rights as protected by the Treaties, by principles of Community law, or constitutional principles of the member states, the Court has struck down the legislation or act. It would be quite remarkable if the Charter were to be relied upon to limit or reverse the development of fundamental rights jurisprudence, particularly as the values that the Court has thus far interpreted are the same values to which the Charter is supposed to relate. Accordingly the better interpretation would appear to be that secondary legislation will not limit the reach of the Charter nor the Court’s application of it to protect or enhance fundamental rights and any secondary legislation will have compatibility with the Charter read into it. Where secondary legislation has specifically legislated for the remit of a Charter right or principle however, the Court will have to respect this intended interpretation unless it causes a clear incompatibility. Thirdly, where the right is partially derived from the jurisprudence of the Court. For example, the right to good administration in article 41 is derived from a general principle of law first recognised by the Court (the history is set out in the Explanations) but the obligation to give reasons is established in article 296 TFEU and articles 41(3) and (4) are guaranteed in article 340 TFEU and article 20(2)(d) and 25 TFEU respectively and the Explanations specifically require adherence to article 52(2) CFR. It is unlikely that the Court will inhibit itself from developing the jurisprudence of the Union, particularly now the Charter rights are codified and binding which supports the improvement of rights by the Court. But it will be interesting to see how the Court approaches these hybrid provisions. In so far as this Charter contains rights which correspond to rights guaranteed by the Convention for the Protection of Human Rights and Fundamental Freedoms, the meaning and scope of those rights shall be the same as those laid down by the said Convention. This provision shall not prevent Union law providing more extensive protection. The Explanations list all rights which correspond with the ECHR and where the Charter provides a wider scope. This will assist with arguing for greater protection under the Charter. For example, citizens of the Union cannot be treated as aliens for the purposes of article 19 ECHR because of the Union prohibition on discrimination on the grounds of nationality. And article 47 on the right to a fair trial is not limited to civil rights and obligations or criminal charges as in article 6 ECHR. Some Charter rights also specifically extend the protection afforded, for example the prohibition on slavery and forced labour derived from article 4 ECHR expressly prohibits trafficking in human beings in article 5 CFR. The Explanations clarify that it is not only the rights as set down by the ECHR that are to correspond, but also the meaning given through the jurisprudence of the ECtHR. It is insufficient therefore to simply refer to the ECHR (the Court already refers to the Strasbourg jurisprudence in the interpretation of corresponding rights: see Case C-400/10 PPU J McB v LE, 5 October 2010 (unreported)). In any event, as the final paragraph of article 52(3) illustrates, the Union can provide greater protection, and therefore must only ensure that it does not provide less. Whilst this provision aims to ensure that the two European Courts do not develop conflicting jurisprudence, the problem remains for novel or narrowly developed rights. This is why the Lisbon Treaty also paves the way for accession to the ECHR by the Union, which will ultimately make the court in Strasbourg rather than the court in Luxembourg the final arbiter on a corresponding right. The Charter is specifically injuncted to be interpreted in harmony with the constitutional traditions of the member states where the right in question is so derived. This is how the Court has always approached its jurisprudence. The Explanations confirm that it is not the lowest common denominator which ought to be protected, but a high level of protection adequate for the law of the Union as well as common constitutional traditions. Where there is conflict between those traditions it seems that the least common approach will lose out. The Court has already had to make these difficult choices (see ERT). Article 53 confirms that the Charter should not be interpreted to restrict or adversely affect human rights as recognised by Union, international or constitutional law. It refers to ‘spheres of application’ for these other sources which raises an issue as to the supremacy of the Charter vis a vis other sources of rights protection. However the Court has grappled with this in Kadi and determined that the Court should focus on the Union measure and its compliance with Union fundamental rights protection. This case was about the restriction of a right rather than the application of international law to extend protection. Given that the Charter seeks to incorporate rights standards from a variety of sources, it is likely that the Court will take a purposive approach and interpret the Charter right to reach the international norm. The UK and Poland (the Czech Republic also intends to extend its application) negotiated Protocol 30 to the Lisbon Treaty in relation to the application of the Charter. In most respects it simply reiterates the content of the general application section of the Charter itself but it seeks to clarify certain aspects of the Charter in two specific ways. Firstly, article 1(1) states that the Charter does not extend the ability of the Union courts or domestic courts to find domestic acts are inconsistent with the rights and principles that it reaffirms. Secondly, article 1(2) states that Title IV (providing solidarity rights) creates justiciable rights only in so far as such rights are already provided for in domestic law. More generally, article 2 also provides that where the Charter refers to national laws and practices it will only be applicable to the extent that the relevant provision contains rights or principles already recognised in domestic law. The purpose of the Protocol was obviously for political compromise. It is not an opt out, as this was would have been easy to state clearly, though it has been described in that way. But it does not in reality make much of a carve out to the Charter either. What it perhaps attempted, amongst other negotiated arrangements for the UK, was to demonstrate to the British public a distinction between the Constitutional Treaty which would have required a referendum and the Lisbon Treaty which Government hoped to show was less of a radical development of EU integration and thereby justify the absence of consultation. In reality, article 1(1) of the Protocol does nothing more than article 51 CFR. Article 51 already confirms that Courts cannot extend the application of the Charter outside the scope of EU law and prior to the Charter where fundamental rights were impacted by EU legislation the Courts would interpret the provision to give effect to the right. Therefore no extension is required to operate the Charter as intended in Title VII and article 1(1) simply affirms current practice. This was confirmed by the Court in NS v Belgium, the most recent interpretation of the Charter in the UK where the Court specifically considered the impact of the Protocol. Articles 1(2) and 2 do in fact create a substantive limit which has not yet been considered by the domestic or EU courts, but only in so far as the UK has not recognised the right or principle in question and this will alter with domestic policy and legislation. Moreover the fundamental rights jurisprudence of the Court is not limited by the Charter or the Protocol, such that Claimants can still rely on the established body of case law even if the Protocol prohibits favourable interpretation by the Charter. It is not yet clear how far the CJEU will go to interpret the Charter favourably in the application of EU law, whether it will engage with principles in a normative fashion or actually add nothing to the existing law. However it has already started to use the Charter in its consideration of cases, both indirectly and upon application. Whether the Charter will make a difference to individuals by building upon the ECHR and national law is the subject of subsequent papers. It will certainly engage lawyers arguing about whether it should apply or not and if nothing more ensures that the rights of EU citizens are more visible, which was the stated aim, even if access to them in practice remains as complex. 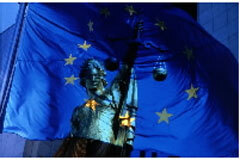 This entry was posted in Discussion and Debate and tagged Human Rights by eutopialaw. Bookmark the permalink. Pingback: EU Law Analysis: The new Opinion on Data Retention: Does it protect the right to privacy?